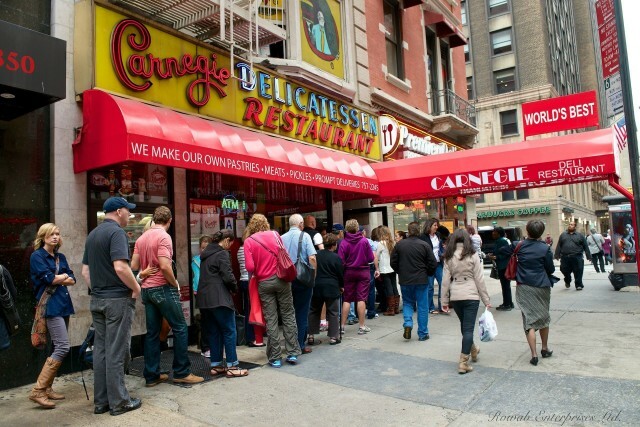 Carnegie Deli in New York is Back! Carnegie Deli, the iconic New York Jewish deli across the street from Carnegie Hall, is back in action after they suddenly closed ten months ago. Its temporary closure understandably distressed fans everywhere, who feared they would never again indulge in an impossibly high tower of corned beef. To the surprise of everyone, they announced their return on facebook this past Monday night and bounced back early Tuesday morning. Dilly, their cheery dill pickle mascot, stood outside the deli handing out samples of pickles and pastrami to delighted passersby. So why the closure? Eater NY reports that it was due to an illegal gas hook-up in the basement, and construction involving gas line repairs. For months, the building was undergoing repair and without heat and gas. The deli, which opened in 1937 adjacent to Carnegie Hall, was heralded as one of the best remaining delis in NYC. It was a favorite of Woody Allen and Adam Sandler and countless other pastrami sandwich lovers. Although it’s not kosher, Carnegie Deli takes pride in their “old world, kosher-style favorites like pastrami, corned beef, and brisket,” which you can order in enormous 1-lb. sandwiches or meat platters. Other timeless favorites include matzah ball soup, chopped liver, kasha varnishkas, and knishes. Next time you’re in town, grab a friend (or five) and attempt a Carnegie Deli sandwich! New-ish Jew-ish delis may be trendy now, but the original, with its outlandish portions and cafeteria-style vibe, is truly irreplaceable. What Makes Rye Bread Jewish? A conversation with Jewish bread maven and cookbook author Stanley Ginsberg.